The FARGO HDP8500 industrial ID card printer and encoder is the superior industrial ID printer for extended-run, high throughput ID personalization and issuance. It’s especially suited for large government ID card programs and laborious service bureau conditions, as well as demanding university and large enterprise environments. Solid metal cabinetry and precision-engineered interior components create a stable printer environment that operates reliably over continuous runs. 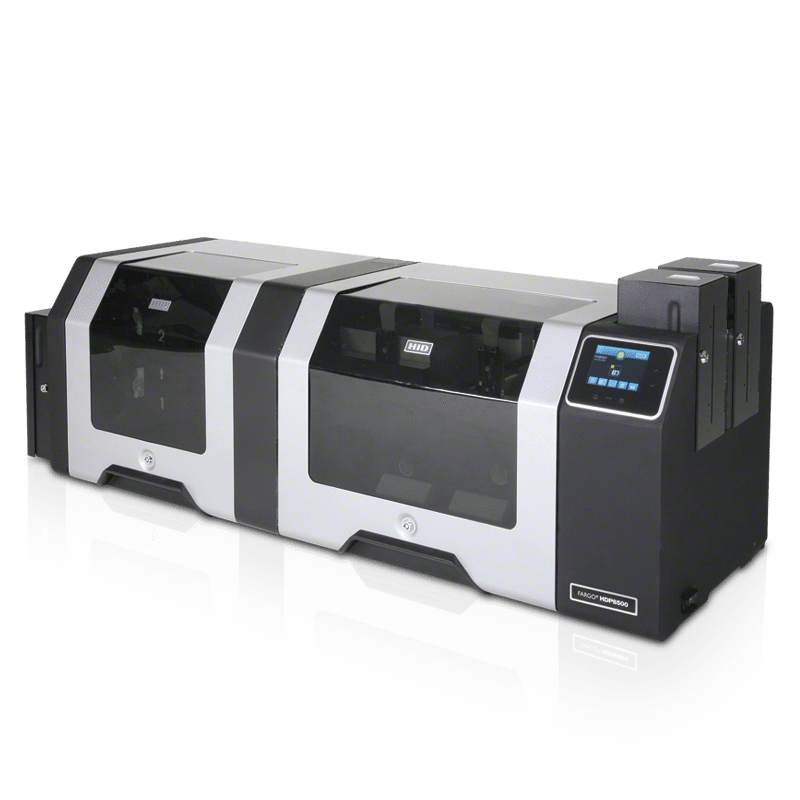 In fact, the HDP8500 industrial card printer and encoder is loaded with features that maximize card yield per shift: multi-card processing capabilities, 400-card input hopper capacity, accessible card path and graphical touch screen interface, and built-in physical and electronic security features. These features are all designed to ensure continuous production, even in the most demanding environments. Combined with the included FARGO Workbench diagnostic utility facilitates printer maintenance. Its Color Assist tool matches spot colors, ensuring accurate prints of graphics such as company logos. The ID Card Printer and Encoder is the heart of the FARGO HDP8500 Industrial Series Personalization System. Combine it with the interoperable Lamination module and the all-new HDP8500LE Laser Engraver to enable the seamless integration of ID card printing, encoding, laser engraving and laminating into one machine, empowering card-issuing organizations to efficiently, reliably and securely produce multi-layered, secure credentials in a single pass through the system. Optionally available, High Durable HDP can be used to create even more robust and durable credentials.